The Best Way to Grasp the Power of Bula is to See it in Action! In just one live demonstration you'll learn why Bula is the pharmacy industry standard to proactively manage compliance risk. Request your live demo today. 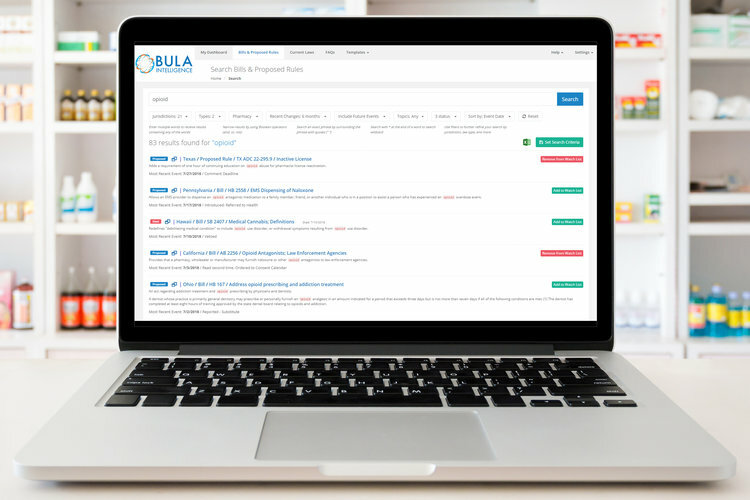 Are you interested in learning how Bula can help you maintain compliance? Do you want to experience how Bula keeps clients aware of timely and actionable regulatory information? Are you curious about Bula's comprehensive legislative database, including hundreds of FAQs with quick and detailed answers? It's time to find the answers. Bula is a software solution that empowers clients by delivering simplified intelligence in an accurate, timely and meaningful manner. It tracks pharmacy bills, regulations, sub-regulations, rules and policies in all 50 states, D.C. and federal. Bula helps clients stay current in a simple and effective way, so they can effectively anticipate and navigate changes in regulation, evaluate and manage risk, stay in compliance, avoid large fines, and preserve customer trust. Bula: evolving compliance from obligation to opportunity.